Just before the weekend exciting news went public. Apple acquired Beats Electronics – a pacemaker in high-end consumer headphones market for $3.2 billion. This tidy sum made Beats’ co-founder Dr. Dre the “first billionaire in hip-hop”, as he said in the video on the night after the deal. 48% of opinions regarding acquisition were positive, 42% negative. Apple was criticized for its lack of creativity. The news aroused plenty of questions and uncertainties in media, ecpecially in digital ones. This article presents general mood in the Internet concerning Apple’s adventurous move. We went through the social media in search for opinions about Beats Electronics acquisition. 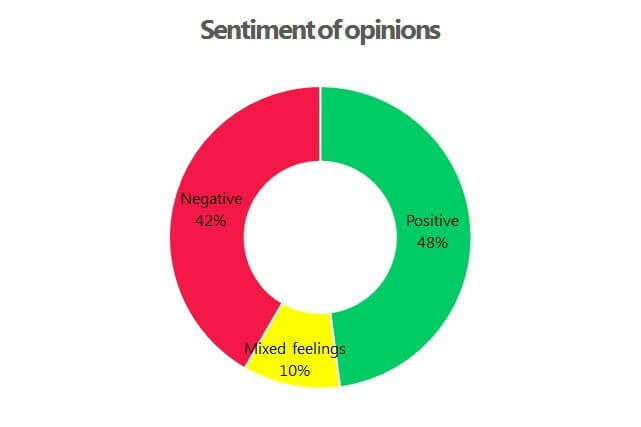 We examined the contents, sources of mentions, sentiment of opinions and what did we discovered? The long and short of it is that within 3 days 16,299 mentions related to Beats acquisition appeared in the Internet, the opinions were split nearly fifty-fifty and the most popular source of mentions was Twitter. The number of threads / mentions was obviously the greatest on the day of the official acquisition’s announcement and in following days it went down substantially. 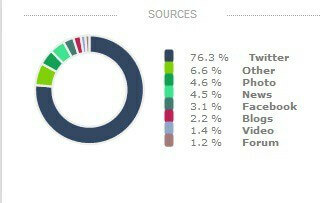 The most popular source of mentions was Twitter, which is still a crucial communication channel in social media in US. Nearly half of the opinions in the analysis had positive sentiment and 42% were negative. However, ample number of social media users could not express their attitude to the news unambiguously and they had rather mixed feeling towards Beats Electronics acquisition. Even though, our analysts found plenty of positive opinions about the deal, those mentions usually refer to Dr. Dre, who was given an ovation for making a fortune on the deal. A significant number of people congratulated Beats’ co-founder. However, Apple is not presented in such a good light. Internet users impute lack of creativiy to the company, which used to be know for developing new technologies and services on their own rather than purchasing complete products. The graph below presents the most frequent reasons of users’ (dis)satisfaction. LOL beats by Dre got sold to Apple? They’re gonna be even shittier now! Yay!! …but not those who are waiting for Dr. Dre final studio album “Detox” to be released. 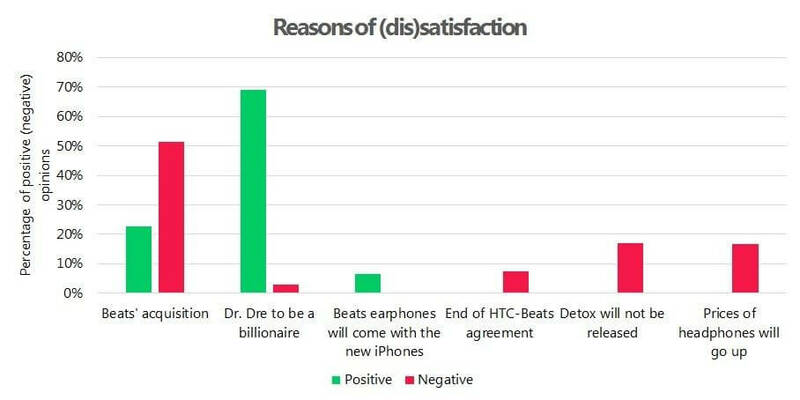 The news about beats by dre yesterday was the nail in the coffin for detox! Will @htc still have @beatsbydre??? Anyone??? Social media users are, by and large, not satisfied with Beats Electronics’ acquisition. Most of positive mentions relate to Dr. Dre and his personal success. On the other hand, Apple is criticized for its lack of creativity, which used to be the company’s advantage over the competition. What is more, common topic of the Internet discussion concerning Beats’ acquisition is the new brand’s name and contract terms, which still remain unspecified.